Scientists at the Hong Kong Polytechnic University (PolyU) used a special kind of lens design known as Defocus Incorporated Multiple Segments (DIMS). These lenses have a central area that corrects refractive issues and defocused segments around the center to heighten the healing impact. To test the efficacy of these glasses, researchers conducted a randomized study with 160 myopic Chinese schoolchildren. Half of the students were given the DIMS glasses and the others were given normal spectacles. Children involved in this study ranged between eight and 13-years-old. All of the children had astigmatism and anisometropia rates of less than 1.5D. At the end of two years, the children that wore the DIMS spectacles were able to slow down the progression of myopia by 60 percent. 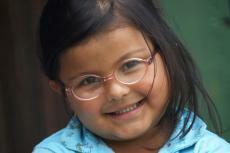 Amazingly, almost 22 percent of the children who wore these glasses completely stopped myopia from advancing. In other terms, the rate of myopia progression in the DIMS group was 0.21mm compared to 0.53mm in the normal spectacle group at the end of two years. Optometrists around the world are impressed with the high numbers in this first DIMS spectacles trial. Many eye doctors believe it won’t be long before these glasses are offered as a viable treatment alternative to myopic children. Professor Carly Lam, who teaches at PolyU’s School of Optometry, was the lead researcher on this DIMS glasses project. Dr. Lam hasn’t released any information as to when DIMS glasses might be available to the public. Although myopia numbers are increasing in children all over the world, Asian nations have been hit especially hard by the “myopia boom.” Countries like Hong Kong, China, Taiwan, and Singapore have myopia numbers well over 80 percent in 20-year-olds. Most scientists believe the myopia boom is due to a multitude of factors that includes prolonged use of electronic screens, lack of sunlight, and nutrient-deficient diets. Doctors recommend parents send their children to an eye doctor for a vision screening as soon as possible.